There are several ways to help get this off the ground. If you are a business then consider sponsorship. Those reading this probably know the goodwill that will be gained by helping make this happen so I’ll say no more. Always happy to chat over ideas with folk. Dig out any old memorabilia you may have and get in touch. 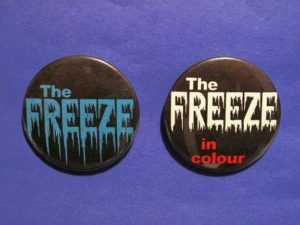 Posters, badges, tickets, t-shirts, photos and anything that you think might be of interest. Items can be donated, loaned or if something is felt to be of some significance then there will be a facility to buy things for the exhibition. We will have an ongoing collection of Scottish music releases old and new for sale so we will be looking for stock. All money made from this will go back into building up the collection so donations would be gratefully received but we would be happy to buy stock too. I will personally add most of my own collection to get things started. Does it have to be vinyl and Scottish ? Not at all. Obviously anything can be sold and the money still put towards building up the Scottish collection. CDs have slowed down dramatically saleswise but every little helps. We are looking for a space during the Festival where we can start to give a hint of what is planned and people can bring in things they think might be of interest. Obviously space is at a premium at this time of the year and it would need to be somewhere central with decent footfall. I will also speak to Edinburgh Council to see what they can offer as they have declared a willingness to help. I’ve already been offered a few interesting items from artists Avalanche has supported that we could auction so look out for some very exciting things in the future. I’m sure we will receive more. Avalanche is a “go-to” site for Scottish music already so I’m happy to use that to promote things just now but eventually it would be good to give the centre its own identity and online presence though I will always be happy for Avalanche to be involved. There is a very big difference between this and Avalanche the shop in that this will be solely based on promoting Scottish music without the scramble to attract sales of new releases which was becoming something of a losing battle anyway. Once the ball is rolling I will of course start to actively seek out things that I think may be of interest. There is of course worldwide interest in Scottish music and it has not been lost on me that the best way to reach that audience and involve them may well be to crowdfund. Once I’ve gauged the initial response it will certainly be a consideration. Is vinyl’s comeback just a fad or does its renewed presence represent a real revival? Buzz chats with Avalanche Records’ Kevin Buckle to assess which is closer to the truth. Vinyl is currently experiencing a bit of a moment. As music formats go, it’s craft beer, whilst the humble CD is closer to a pint of Tennent’s: the sleeve art, the booklet and most importantly, the sound quality. You get so much more than with its alternatives. Edinburgh boasts an impressive collection of vinyl stockists, from the obvious large music retailers to Independent crusaders such as Vinyl Villains, CODA music, Elvis Shakespeare, Underground Solu’shn and VoxBox Music. There are numerous options available for aficionados and burgeoning collectors alike. Even Tesco has begun re-stocking them. A quick Google search reveals that sales of the medium have grown by well over 50% in the past two years. 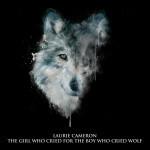 The vinyl chart has even been relaunched. So can vinyl maintain momentum and continue its meteoric rise? “Probably not,” according to Kevin Buckle, who is uniquely qualified to say so. He is the owner of Avalanche Records (named after the Leonard Cohen song of the same name covered by Nick Cave when the shop opened in 1984) and a mainstay of the Edinburgh music scene for the past 30 years. We meet in the Tron Kirk on High Street where he currently has a cosy stall in the corner of the market. Nestled between posters of Taylor Swift and Arcade Fire are a few wooden boxes of vinyl and a rack of CDs that sit beneath a large stained glass window. Its simplistic décor gives off a rustic vibe. Kevin could talk all day about music. His knowledge seems encyclopaedic as he recalls obscure album tracks and dates in the matter of fact way that only someone truly passionate about a subject can do so. As a statistician, he also conveniently references much of what he says with the figures to back it up. 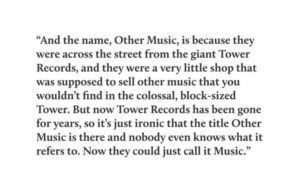 It’s when we’re a few minutes into the conversation that I realise Kevin is someone who thinks far more about the big picture and beyond the recent resurgence when it comes to vinyl. He isn’t as dogmatic about the format as I had expected and in his own words, “vinyl has got nothing to do with it, it’s about the music”. His interest lies more in the promotion of new music, something he believes this revival doesn’t necessarily do. He continues by citing the vinyl chart for last year in which the top ten contained four albums from the previous two years and then older artists such as The Beatles, Pink Floyd and Led Zeppelin. It’s an outlook that had never occurred to me. When I look for a new album, I never really consider buying vinyl as my first port of call and I become acutely aware that I fit perfectly into the stereotype he has just described. Despite its obvious benefits, “for most bands, it’s not viable” because put simply, “they just won’t sell enough” and I get the sense that this is what Kevin feels is the big drawback. He qualifies this by identifying himself as a huge fan of vinyl because of the tangible benefits and “what it adds to the music,” but it’s apparent that the idea of selling the Beatles “Revolver” to a young kid and thus introducing them to real music isn’t his thing. He is far more focused on the present day. When we discuss challenges facing record shops, he cites age-old independent versus large retailer issues. Specifically, the chains buying power allowing them a larger percentage of the stock available, whereas independents have to buy in smaller quantities. An interesting quirk of this is that often these large retailers (one in particular) allocate disproportionately higher amounts of floor space than their vinyl sales justify as a form of advertising. As Kevin puts it, “look at us: we’re cool, we sell vinyl”. It’s an approach he describes as “galling,” mostly because it further limits the amount of pressings available. Despite these challenges, shops in Edinburgh are managing to sell both new and second-hand music (mainly in CD and vinyl respectively) and while they may not be thriving, hopefully they will continue to survive. So what of the future? And as for the future of other formats? That isn’t as easy to predict. CDs will probably endure as they have “an awful long way to fall,” but “given that nobody saw streaming coming,” who knows? You can follow his musings about the state of music in Edinburgh and beyond on his blog which also doubles as an online shop. I’ve edited this just a very little to correct a couple of things. Interesting piece in that Jason actually quotes what I said rather than so many who paraphrase and get it wrong. Old skool attempt at a headline too ! As I’ve said before my entire knowledge of New York comes from all the customers Avalanche has had over the years. Other Music’s imminent closure reminded me of two stories I would tell on the basis that if New York kids weren’t cool then youth culture was doomed. Several years ago when we in the Grassmarket a father came in with his son and spent a while browsing buying a good mix of “cool” indie stuff. The father said to his son that he would buy him a few t-shirts and what did he want. At the time we had a good selection all hanging up along the back wall. Lots of local and Scottish band shirts and unusually some metal and punk shirts I’d bought as a job lot. First pick was a Green Day shirt and immediately his dad winced. “Son” he said. “We are in Scotland. There are lots of cool shirts here you won’t find anywhere in New York why not buy them.” It was the turn of his son who must have been 14 or 15 to wince. An awkward silence ensued so his dad tried to compromise. He said his son should pick an Avalanche t-shirt, a local Scottish band shirt and another more mainsteam shirt. 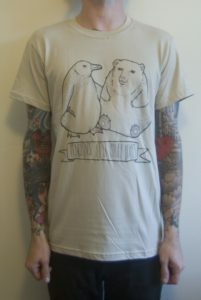 After some discussion they settled on a Penguins Kill Polar Bears shirt. “No other kid in New York will have this ” he told his son. His son then decided to stay with the Scottish theme and picked a Biffy Clyro shirt to add to a classic black Avalanche shirt. I’d finish the story saying that when the dads of New York are begging their kids to be cool then you now that we have started to reach the beginning of the end times for cool youth culture. It was a scenario I would see repeated many times as cool parents tried to interest their children in things less mainstream. Another slightly more hopeful story was just a little later. Three couples all from New York came in with half a dozen children. The kids all moped around while the parents all bought stuff but towards the end the kids spotted the posters and started looking through them. Come time to leave and the kids asked if they could stay. The parents slightly surprised immediately agreed and said they would go for a quick coffee. They returned 30 minutes later and again the kids now engrossed looking through all the different piles of posters wanted to stay. The parents agreed and said they would go and do a bit of shopping. Returning 40 minutes later the children had finally been through every poster pile in the shop. Without hesitation the parents bought their children everything they had chosen. As they handed over the cash one of the mothers remarked ” You should hire this place out as a teenage creche. We’ve had a wonderful time while leaving them here.” Then one of the dads added “You should open in New York, it’s great just to see the kids looking through posters like this rather than browsing the internet”. So now it seems we live in a world where parents are cooler than their kids and the the kids are happy with it that way. And my own daughters ? Well at nursery they were the coolest kids there with their Nick Cave, Hefner and Bright Eyes t-shirts. Now they just wear branded clothing but my eldest does wear a Withered Hand t-shirt I gave her quite a lot and through choice owns that PKPB shirt so I count that as a minor victory ! It has been suggested it would be good to have something in place in time for August and the Festival. Obviously time is tight but as I’ve said before a lot of the work has been done already. What I really need are others who would like to get involved either in assembling the exhibition or sponsoring it. I am also looking for a business partner for the label and our plan to send Scottish albums all over the world. Again there is already a lot of interest from abroad in this. I will now aproach a few obvious people who will I’m sure be interested but it would be good to get as much input as possible. The idea is being taken very seriously by museums and galleries but unsurprisingly they have very little of use themselves. So much so they may indeed be interested in acquiring particularly important pieces of memorabilia for the future if something becomes available. 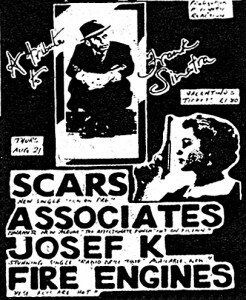 I’ll put out more information on what we are looking for later this week but it is clear from social media there are lots of old posters, tickets, pictures etc still lovingly kept and hopefully bands and labels themselves will have things to offer. I’ve already heard from some labels old and new offering exciting items. We will also need as much as we can get on the music side of things so will be asking folk to dig out anything they no longer need. Items can be donated, bought or simply loaned when needed. I’ve never been to New York so all I know is from the many customers we have had from NYC but both from reputation and personal recommendation Other Music was always clearly a very important record shop. Having played host to Neutral Milk Hotel, The National and Interpol to name just a few bands Avalanche are also well known for supporting they obviously had our admiration but they were much more than that covering a wide range of underground and experimental music along with a fantastic choice of soul, funk, jazz and disco. 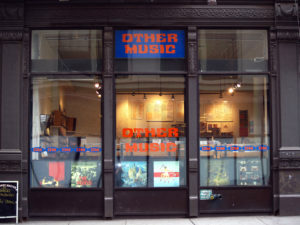 One NYC customer described it as like several of the best UK record shops all mashed into one. If new music is going to survive on the high street these are the shops that matter. Any number of second hand shops dabbling in new vinyl can pop up and that is fine but unless new music is to move completely online its fate is left in the hands of a dwindling few. While the way people choose to listen to music is a factor the elephant in the room is that even the best of shops are faced on a weekly basis with releases by some of their best selling artsists not available to shops. The profit from the latest Radiohead 7″ would pay a member of staff for a day. The profit from the very limited indies only vinyl version of the new Radiohead album might pay the rent for a few days. However the £60 box set is only available from the band and the last album as a £40 box set grossed them 4 million pounds more than the yearly turnover of all but a handful of shops worldwide. Of course the irony with Radiohead is their label XL is owned by Martin Mills who of course also owns Rough Trade. Other Music will also continue with their label so maybe labels are the future ! I can only wish everyone at Other Music all the best. 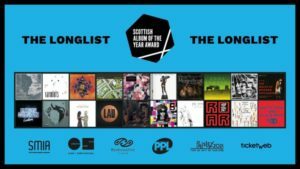 I waited with interest to see the longlist for the SAY Awards and it did surprise me a little. It is set up in such a way that all genres will be represented and what tends to happen is the small to medium sized indie bands Avalanche supports get squeezed out as the indie sector votes for the big indie bands. However one or two do normally sneak in more often than not to do with friends amongst those contributing than anything else but this year there are none. Obviously artists like Admiral Fallow, Steve Mason and Emma Pollock do well for Avalanche but this year there were no less well known “indie” artists to benefit from the publicity the award brings. I know in previous years many of the artists I would have hoped to see included have hovered just outside between 20 to 30 but this year I held out hope for only a couple. Our best selling album from Laurie Cameron which was well received elsewhere doesn’t feature of course and I thought the Filthy Tongues might have had a chance being in everybody’s minds as it was only recently released but it was not to be. What was of course unforgivable was the exclusion of the There Will Be Fireworks album “The Dark, Dark Bright” a couple of years ago ! Others previously like Star Wheel Press despite being championed by not just Avalanche but others like Ian Rankin only made it to that 20 to 30 ranking. The Scottish media are always keen to show how diverse the Scottish music scene is maybe sometimes at the expense of music people actually prefer to listen to but from Avalanche’s viewpoint we are always looking for the new Frightened Rabbit, Twilight Sad, Withered Hand, Ballboy, Belle and Sebastian or indeed Mogwai. Record companies meanwhile still seem to be searching for the next Biffy Clyro or The View ! Of course as Avalanche resurrects its own label and looks to the History of Scottish Music maybe we will discover the new Josef K or Orange Juice ! You are currently browsing the avalanche records blog archives for May, 2016.